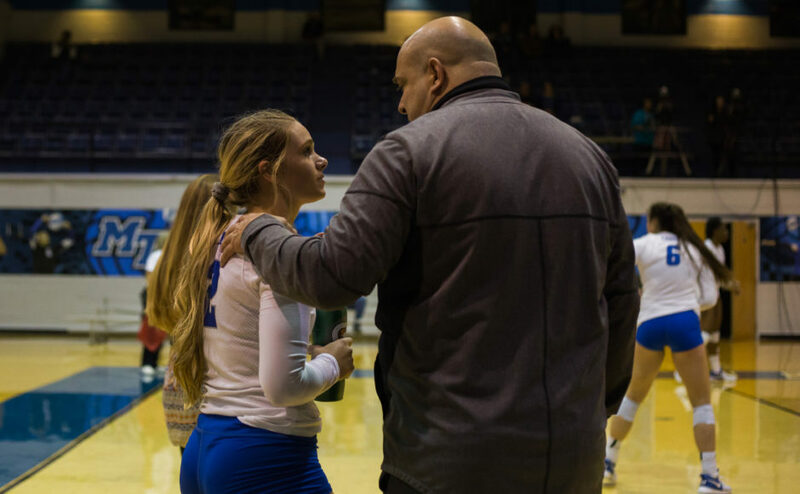 The Blue Raiders volleyball team (5-13, 0-5) fought hard against C-USA powerhouse Rice University Owls (13-4, 4-0) at home on Friday evening, but they were ultimately unable to get the job done as they lost the match 3-0. The Blue Raiders looked strong in the first set with 14 kills and only three errors. The score went back and forth but stayed close throughout the set until Rice eventually took control and won 25-18. Rice wasted no time in the second set, taking an early 12-3 lead and staying ahead by at least 10 points through the remainder of the set. 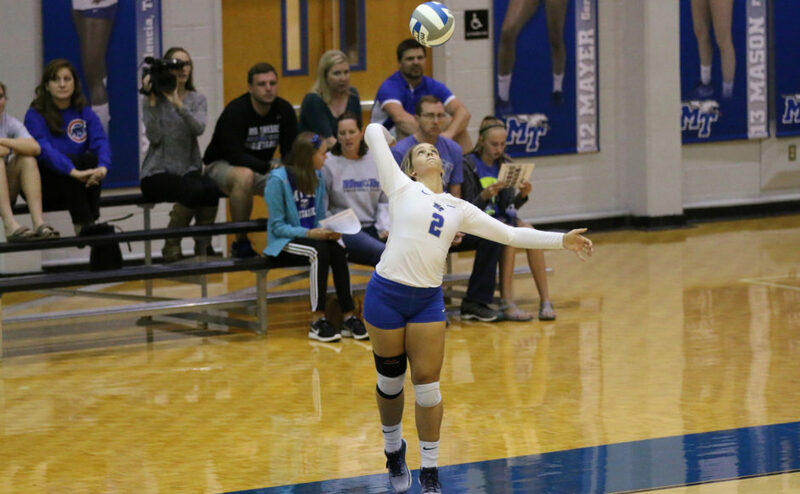 The Blue Raiders struggled with only eight kills and five errors while Rice had 17 kills and only one error. 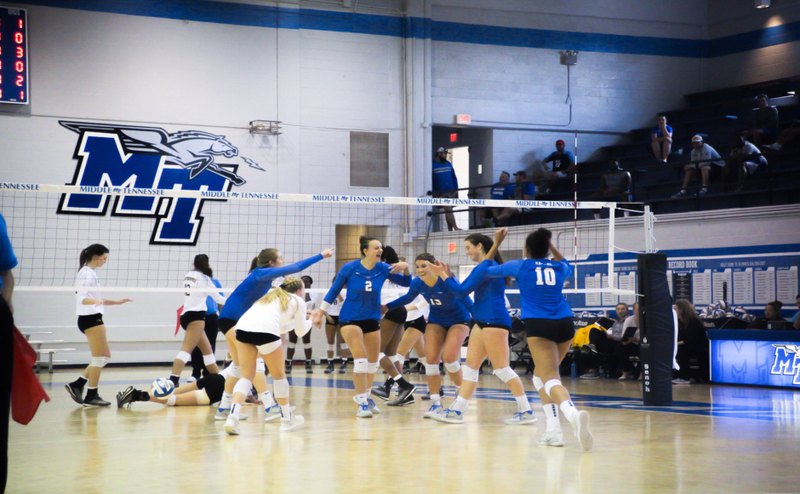 MTSU could not keep up and dropped the second set 25-13. The final set looked a bit more hopeful for the Blue Raiders in the beginning, but six MTSU errors helped Rice gain momentum and come away with a 25-16 win to end the night. Rice is currently the top C-USA team with a perfect conference record this season and only four total losses. They played with consistency and only had four total errors, compared to 14 for MTSU. Redshirt sophomore Aubrie Huddleston led the Blue Raiders with eight kills, followed by senior Bailey Mason with seven kills. Junior Taylor Hammill contributed 27 assists throughout the match, along with junior Brienna Tankesley’s 11 digs. Sophomore Nicole Lennon controlled the Owls’ offense with 14 kills and one block, with junior Adria Martinez contributing 26 assists along with Junior Lee Ann Cunningham’s nine digs. The Blue Raiders continued their home stand against conference rival Western Kentucky University (14-6, 5-1) on Sunday. The Blue Raiders came up short again against the Hilltoppers. It was the second contest among the two teams this season, with the first being at WKU. Junior Dora Peonia led the Blue Raiders offense with 10 kills while Huddleston and Mason had a combination of 17 kills. However, freshman Julia Valdez and sophomore Josie Maxim had five kills each, helping out the Blue Raiders offense. In addition, Vonnie Covington tallied three kills too as well as having three blocks in the four-set match. Hammill contributed 36 assists while also having six kills and a dig. For defense, Regan Coughlin took control having ten digs adding to Tankesley’s nine. 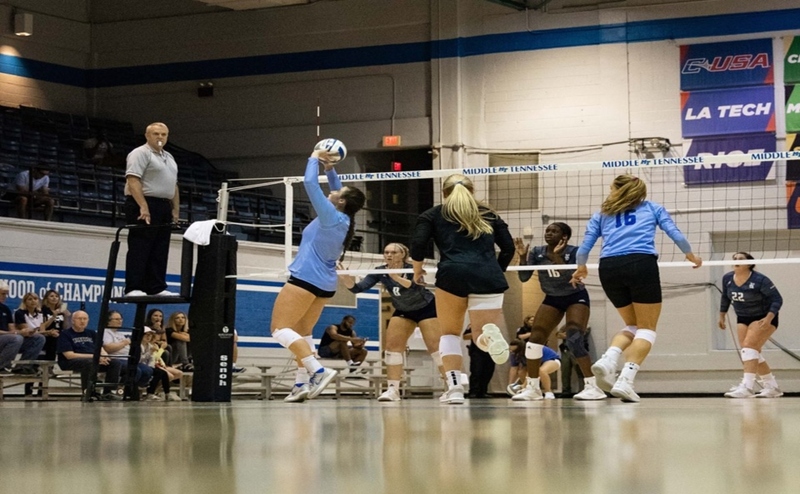 Although the Blue Raiders started off strong, the Hilltoppers responded and captured the momentum by taking the lead and winning the first set 25-21. Western Kentucky came out dominating in the second set, taking an early lead. Despite the Blue Raiders resiliency, it was not enough to come back, and Western Kentucky claimed the second set. MTSU was able to get into a rhythm in the third set. The Blue Raiders were able to gain momentum with a 10-2 run over WKU and win the set 25-20. 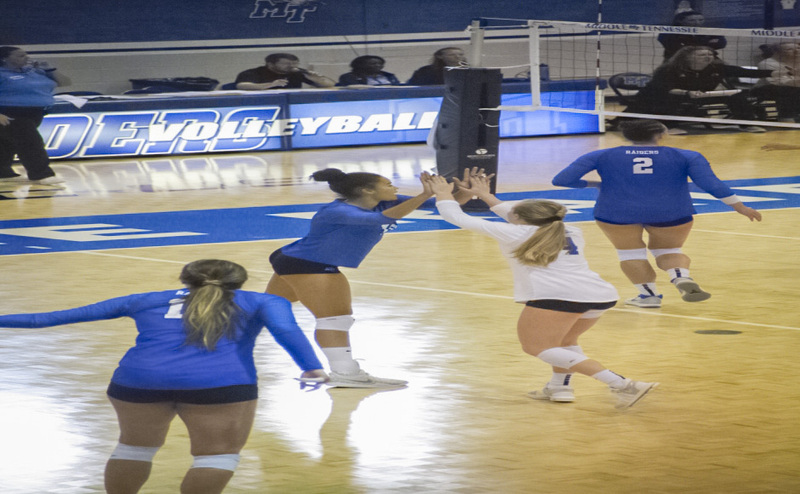 In the fourth and final set, the Blue Raiders were unable to sustain their momentum and fell in the final set 25-16. Middle Tennessee continues their conference play as they take on Charlotte in North Carolina and Marshall in West Virginia this weekend. The Blue Raiders will face the Charlotte 49ers on Friday and the Marshall Thundering Herd on Sunday.